Other options you may want to consider such as bringing your own vehicle, renting a car, hiring a taxi or Uber, etc. Walt Disney World Transportation is HUGE! One of our Disney sources told us that Disney has the ninth largest boat fleet in the world. We’re not certain if this is legend or fact, but I do believe it’s possible! The Walt Disney World Resort covers about 40 square miles or 25,000 acres, which is about the size of San Francisco. With an area this large, it is no wonder the Walt Disney World Resort instituted what is considered by some to be the best transportation system in the world. Walt Disney World offers guests transportation throughout the grounds. Though many guests prefer to use their own cars, rentals, taxis or Uber, using Disney transportation can offer a welcome relief from driving! 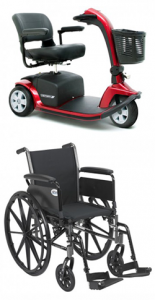 It can also make getting around Disney easy if you’re using a wheelchair or ECV. Is there a downside to relying on Disney World transportation? Two words – Crowds and waiting. There are times you’ll experience very little waiting and practically empty buses, boats and monorail cabins. Yet sometimes there are long waits, long lines and standing room only crowds once you board (this may be a challenge for those with allergies or claustrophobia). There are times when a bus is so crowded that the bus driver can’t allow else anyone on. You’re stuck waiting for the next bus which could come moments later, or as much as 20 minutes later on average (but it can be longer). Also, many of the resorts share transportation with other resorts, or have more than one stop, so you’ll have to make anywhere from 1 to around 7 stops before getting to your stop, depending on the resort. What you’ll encounter will depend upon the season you’re visiting, the time of day you’re traveling, and the locations you’re traveling to and from. If any of this sounds challenging to you, consider renting or bringing a car. If not, you’ll enjoy taking a break from driving, and you’ll love the fact that it’s free. Yes, all Disney World transportation is free. The other thing that might be challenging is going from resort to resort. We’ll talk about that below. Every resort gives you transportation to all of the four main parks and Disney Springs. From Disney Springs you can get to every resort, but there’s NO transportation to the four main theme parks. You can get to Typhoon Lagoon though. From the four main parks you can get to any other of the four main parks, and all of the resorts. The Transportation and Ticket Center gives you access to the resorts on the monorail line (Polynesian, Contemporary, Grand Floridian), and two parks – Epcot and the Magic Kingdom. You can also catch buses to the non-Disney resorts at Hotel Plaza (Bonnet Creek Hilton and Waldorf Astoria), and Shades of Green. These are not Disney transportation buses and are considered charter buses by Disney, so they’re in a separate loading area. There also may be buses to Epcot if the monorail is down. Disney sometimes adds additional bus service here as needed during special events or during crowded conditions. There will always be Cast Members there to direct guests so feel free to ask about it. You can walk from the Polynesian resort to the Transportation and Ticket Center. Disney has reduced bus service to the water parks. You can pick up a bus to Typhoon Lagoon at Disney Springs, and you can get a bus directly to Blizzard Beach from the All-Stars resorts or Coronado Springs. If you’re staying anywhere else you’ll have to take a bus to Animal Kingdom where you can pick up a bus to Blizzard Beach. In the summer Disney opens bus service from the four main parks to Disney Springs, starting at 4 pm. This is a one way service. There are no buses going back to the parks from Disney Springs. 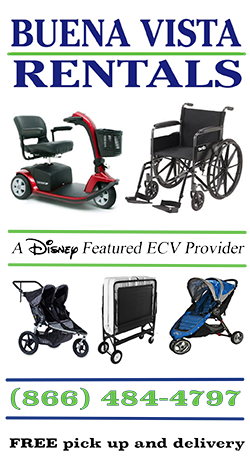 Disney Transportation in a wheelchair or ECV – You’ll find articles with in-depth information on using Disney transportation in a wheelchair or ECV about halfway down the page. Some resorts have their own dedicated transportation, but many of them share with other nearby Disney resorts. For example, the Beach Club Resort shares bus and boat transportation with The Yacht Club, Boardwalk Inn, and the Swan and Dolphin resorts. What this means is that the buses and boats usually stop at each of these resorts on the way to and returning from its destination. Shared transportation has its pros and cons. The benefit is that you’ll be able to get to any one of these other resorts from your resort without having to transfer. You can enjoy the dining, ambiance and shopping at each of the resorts. The down side is that you’ll have longer (sometimes much longer) rides and bigger crowds. We share the transportation details for each resort on the resort web pages on this site. What if you wish to go from your resort to another resort, and it’s not on a shared route? You have a couple of options that involve transferring. 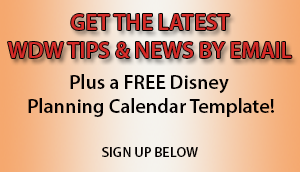 First you can take Disney transportation to Disney Springs or the Transportation and Ticket Center. From those locations you can get transportation to any resort. The other option is to find a park near the resort you wish to visit. When you check in at your resort, just ask the cast member for a Disney map. Find the resort that you wish to visit and locate the nearest of the four main parks. Take Disney transportation to that park. From there you can catch a bus, boat or monorail (depending upon what’s available at that park for that resort) that goes to the resort you wish to visit. Make sure the park you’re going to is open to be certain transportation is still running from that location. Don’t forget to look at park closing times before you go. The parks can close earlier than your plans require. You could then choose another location to transfer such as Disney Springs. Also, it’s a good idea to avoid the parks around closing time. The transportation can become mobbed, and you could find yourself waiting in very long lines. The Walt Disney World Resort hosts a fleet of trams designed to transport guests from the parking lots to the theme parks. The trams typically begin service about one and a half hours prior to the parks opening and typically conclude service about one and a half hours after the parks close. If you’d like to see a transportation map that shows all the routes and transportation methods Disney offers, check this out from wdwfocus.com. Click on the link to go to their site where you can see a larger version that allows you to enlarge further with a magnifying glass option. Thanks to Patrick Wall for contributing! From the Transportation and Ticket Center, you can get to the Magic Kingdom. You can also take the Monorail to Epcot, but if you have your own transportation, that may not be the most direct way. If the Magic Kingdom is open, you HAVE to go to MK and transfer to a bus to get to Animal Kingdom or Hollywood Studios.